“People only want three things.” Here, Nan would pause. So we could fill in, Lucy with her answer, me with mine, Nan squeezing peppermint extract onto her tongue, which made her smell like a cross between a candy store and a Christmas tree from all her heartburn and upset. Toward the end, when she didn’t leave the couch, we pulled sheets over the cushions and wedged a railing on the side, rotating her like a spit pig to prevent bedsores. “Chase dreams, not people.” She’d break it down; give us the Cliff’s Notes of life. “You’re either this type or that.” My mother was a winner who chased a loser, which is how Nan wound up raising us. Sixteen years older than me, Lucy rejected Nan’s fountain of sayings. They fought all the time. Now that Nan’s gone and Tim’s moved in, Lucy doesn’t come around much. For hours, my earworm is quiet. Knock wood, count your blessings. Beauty fades. I snap on gloves to color my hair. As the peroxide seeps in I think about brain cancer, the tingle in my scalp building to a dull, heavy ache. Everything comes at a price. Before us, Nan was a hair model. Although the tumors that took her bloomed late, chemicals zapped every stubborn strand when she was young. Sometimes, she’d let me comb her wigs. They sat atop faceless busts on her vanity. Had she kept her hair she might have become somebody. Instead she poured her hope into Lucy. Lucy never had time for boys because Nan kept her booked with auditions: commercials, afterschool specials with real speaking parts. Lucy could have gone places, Nan said, if only her heart had been in it. Tim works full-time. He cooks, cleans. The egg timer pings, the sulfuric smell rising, pungent and deep, from every follicle and pore. I vomit before I rinse, style, dry. Lucy calls. I’m dusting onion soup mix into a bowl of sour cream and dredging potato chips through it. The Baby Story is on so I’m half-listening. I can barely make sense of her choked cries. Honestly, I don’t feel like going anywhere, but who else does she have? I’ve been on the couch for so long I leave the depression for my body, numb legs. I may have pinched a nerve. When I get to her place, her nose is reindeer red. She looks so old and ragged it’s hard to believe we’re sisters. The drama program’s been cut for next year. So much for Our Town and Pippin, A Midsummer Night’s Dream. We make trips to her car bringing props from her classroom: capes and canes and skeletons and hoop skirts and taxidermy, stuffed otters disemboweled and mounted on plaques. She hands me these spiky things. A gift for Tim. I take them and she rubs my bump like it’s a genie’s lamp, like I’m some kind of dream-maker, but there is nothing to these bad boys but smoke and mirrors. They are hollowed out plastic. They carry no weight. 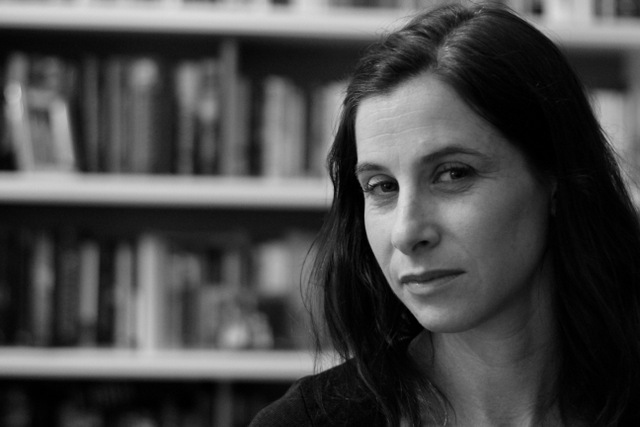 Sara Lippmann‘s debut collection DOLL PALACE (Dock Street Press) was long-listed for the 2015 Frank O’Connor International Short Story Award. She is the recipient of a 2012 fellowship in fiction from the New York Foundation for the Arts, and her work has appeared in Mr. Beller’s Neighborhood, Wigleaf, Slice magazine, Tupelo Quarterly, Joyland and elsewhere. She co-hosts the Sunday Salon, a longstanding reading series in New York’s East Village.